Remix OS, which came out recently, is a killer Android variant that brings a slick desktop-style interface to Android. Now, you can install it on a USB stick and try it out on your computer. Android isn't exactly built for a keyboard and mouse, but that hasn't stopped some of us from trying. RemixOS, from developer Jide, wants to change that by adding features including a desktop and windowed apps to Android. Here's how to try out the very experimental alpha. Disclaimer: According to Jide's website, this OS is "for developers and early adopters who don't mind a bug or two". In our testing, there were considerably more than two bugs. While RemixOS is an awesome concept and it's fun to play around with, don't expect this to replace your current computer anytime soon. 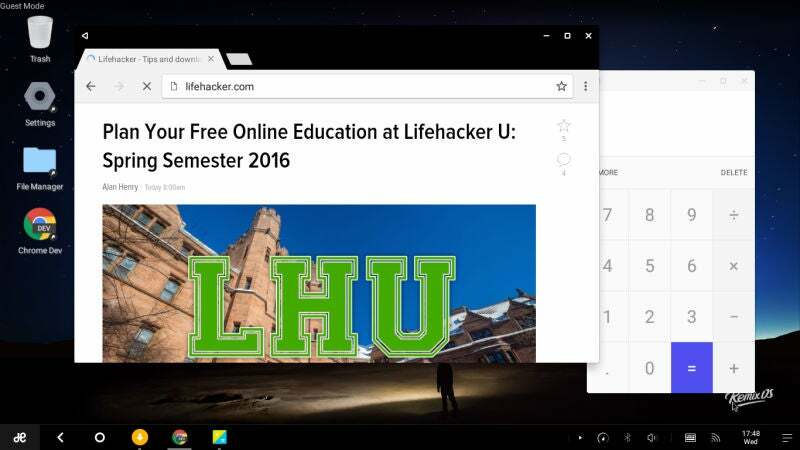 However, if you're into being on the bleeding edge, tweaking your computer and playing around with experimental software (which might explain why you're reading Lifehacker), by all means, continue. 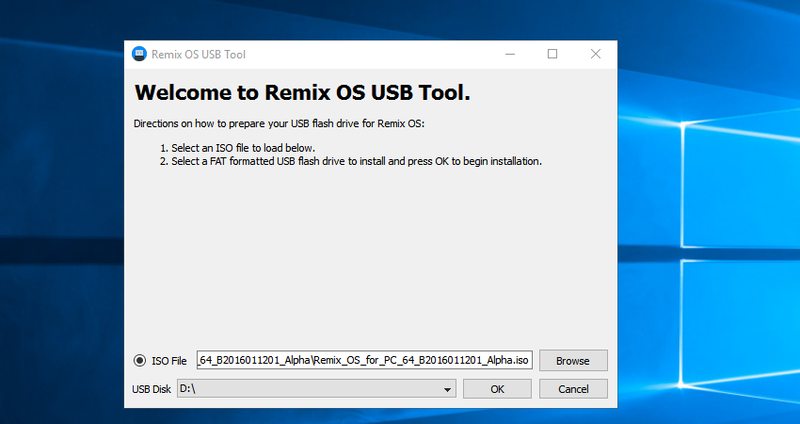 RemixOS for PC package: You can download the installer package for RemixOS from here. The package is just shy of 700MB, so if you're on a slower connection, start the download and then grab a snack or something. An 8GB+ USB stick with 20MB/s write speeds: RemixOS requires a minimum of 8GB of free storage to install and run. If you plan to use Resident mode to keep your desktop persistent, you'll obviously want more. Also, Jide recommends a stick with 20MB/s write speeds (the SanDisk Extreme should work very well). In my testing, I found that a stick with less than 10MB/s write speeds worked, but it threw an error and took a while to load. Note: Creating the RemixOS drive will wipe your USB stick, so be sure to backup any files already on it. An x86-based computer: RemixOS is an x86 variant of Android and, as such, it only runs on computers with Intel and AMD processors. ARM-based computers (such as many Chromebooks) and older Macs will not work. You'll also need a Windows PC in order to create the USB stick. Creating the bootable USB stick will take less time than most OS installations, but it will still take a little while, so be prepared for some waiting around. Once you have everything you need, it's time to get started. Next to "ISO" click the Browse button and choose the RemixOS .iso file. Next to "USB Disk" choose the drive letter associated with the USB stick you plugged in. Resident Mode: This will treat your USB stick like a portable computer. Any settings you change will be remembered, no matter which computer you plug it into. Apps you install and files you download will be written to the USB stick. This means the bigger your USB stick is, the more space you'll have to install things. 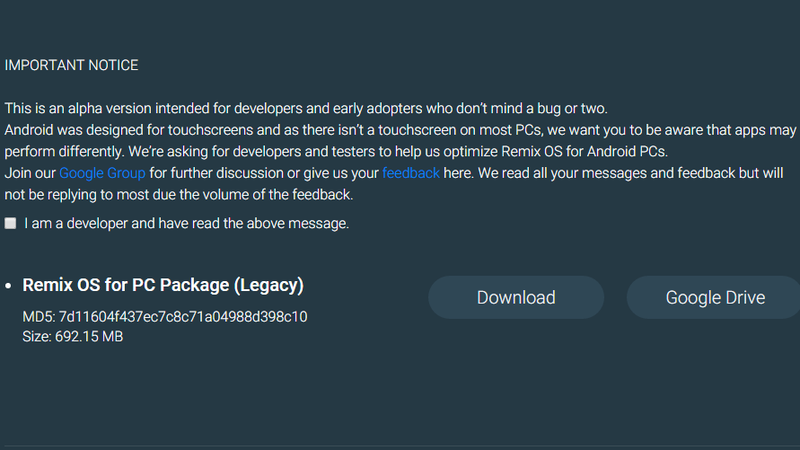 Despite how the promotional material looks, RemixOS does not come pre-installed with the Google Play Store, or any of the related Google apps. Previous limited release versions of RemixOS did, so it's unclear if this is an oversight, or if Jide simply doesn't have the licence to distribute the Play Store publicly. Open the Settings app, click Security, and enable installing from "Unknown sources". In my testing, Google Play Services installed, but many functions still failed to work properly in Guest Mode. Some apps like Chrome launched and worked relatively well, while other apps like Netflix failed to launch at all. Again, none of these apps are designed to work with RemixOS, so if an app doesn't work, don't blame the developer. After all that, you're probably wondering if it's worth going to all the trouble. Well, here's the short answer: kind of? I've played around with it for a few hours since the release last night and I've run into enough problems that would keep most casual users away. But that's OK! 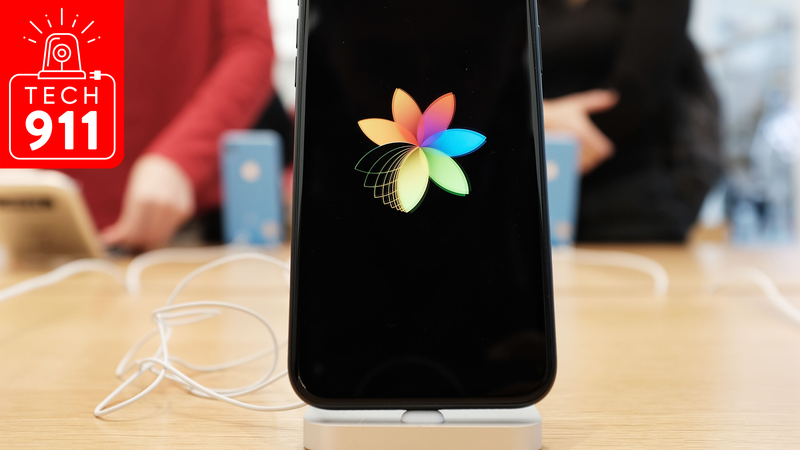 It's a developer and enthusiast-focused alpha. What does work, however, paints a pretty rosy picture for Android on the desktop. For starters, RemixOS has tweaked Android's basic interface to feel a lot more at home on the desktop. 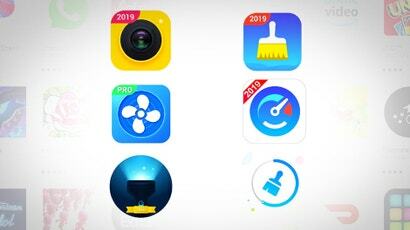 There's a taskbar at the bottom of the home screen for launching apps, a Start-like menu for searching your files and finding other apps you have installed, and a system tray for things like Wi-Fi connections, date and time, and a slide-out notification tray. Frankly, it looks a lot more like a clone of Windows 10 than it does Android. Ultimately, the problems with app compatibility means that RemixOS is unlikely to replace anyone's daily driver. However, given that Android was never intended to be a desktop operating system, RemixOS does a remarkable job of convincing us that it could be. Anyone figured out how to get it running on a virtual machine? Google won't licence the various account and integration services for pre-installation by third-parties (except OEMs). So don't expect Play Store and Services to appear in future versions. When installing ROMs on Android, it's easy enough to flash a zipped package of Google stuff to get that functionality. So it's reasonable to assume these guys will produce or link to something similar in time.